1. 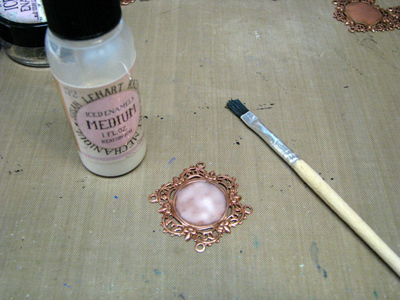 Apply a thin coat of enamel medium to a Victorian Bracelet Plaque using an Iced Enamels brush. 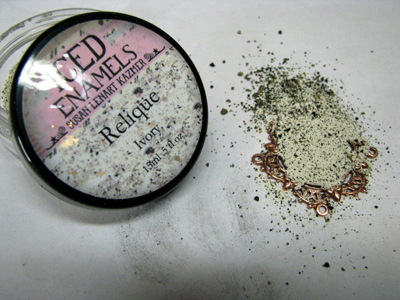 Lay on a sheet of paper and pour some Ivory Relique powder into the center of the plaque and pour excess back into container. Place on non-stick craft sheet and heat with heat gun until starts to bubble. Repeat this step for brass and copper Victorian plaques. 2. 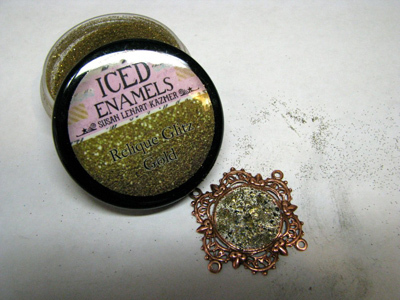 Apply a thin coat of enamel medium on one of the copper bracelet plaques then sprinkle a tiny bit of Relique glitz gold and reheat. 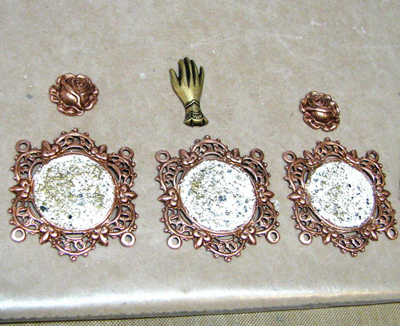 Repeat with the rest of the copper bracelet plaques. 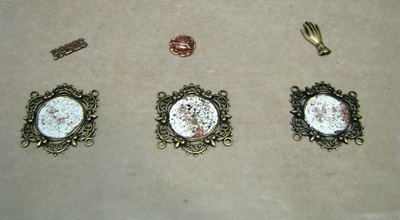 Repeat using copper glitz for the brass bracelet plaques. 3. Choose which charms you want for the bracelet plaques and have them ready on a non-stick craft sheet or non-stick surface. The plaques will be connected to each other using jump rings. 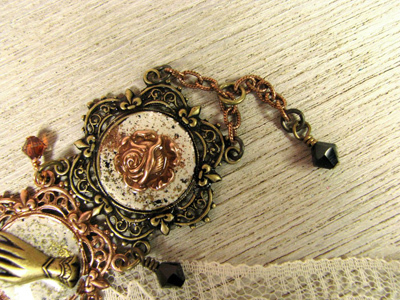 Make sure the pointed ends of the plaques are pointed up and down for the bracelet and left and right for the necklace for the correct placement of your charms. 4. 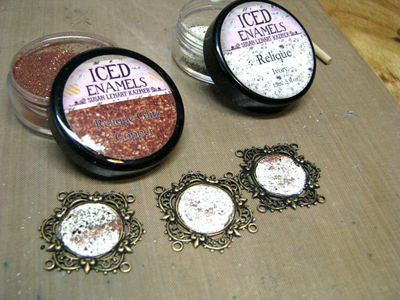 (pic step 5) Prepare ICE Resin per manufacturer instructions and apply a very thin coat to the plaques. 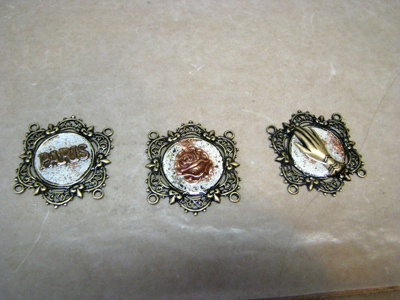 Place the charms on the plaques and set aside to dry overnight. 1. Connect 5 bracelet plaques together using 6mm jump rings. 3. 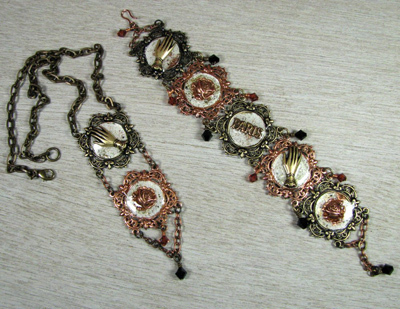 Cut copper chain into two approximately 1" segments (7 links) and one approximately 1/2" segment (5 links). Connect a 7 link segment to one end of the bracelet using 5mm jump rings. Using a 6mm jump ring, connect the 5 link chain segment to the middle of the 7 link chain. (this is an extender chain). Connect a wrapped Swarovski crystal dangle to the end of this 5 link chain using a 5mm jump ring. Repeat for the other side of the bracelet but instead of an extender chain, connect a hook clasp and a Swarovski crystal bead dangle. 1. Cut an approximately 2" piece of copper chain (13 links). Create two Swarovski crystal beaded dangles. Connect one of the crystal dangles to the bottom of one of the plaques using a 5mm jump ring. Connect the copper chain to the two bottom loops of the plaque using 5mm jump rings. Connect another Swarovski crystal beaded dangle to the middle link of the copper chain using a 5mm jump ring. 2. Connect a plaque to the plaque from step 1 using 5mm jump rings and 2 links segments of copper chain. 3. 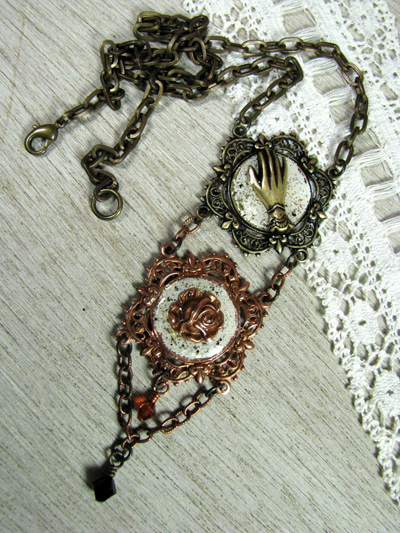 Connect 8" lengths of brass chain to both sides of the pendant using 5mm jump rings. Connect a lobster clasp to one side of the necklace using a 5mm jump ring and an 8mm jump ring to the other side of the necklace. 1. 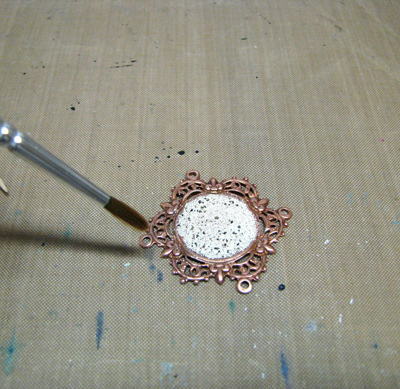 You can use a paint brush to remove the enamel powders from the filigree before heating. 2. 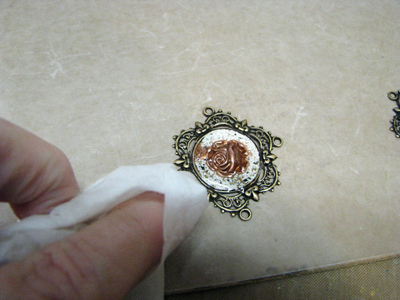 If you over pour the resin, use a baby wipe to remove the excess. Do this about every 5 to 10 minutes until the seeping has stopped or at least slowed down. 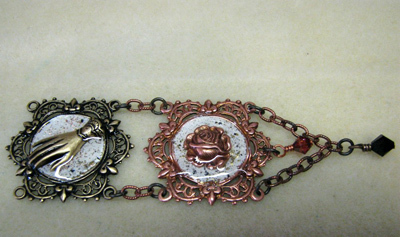 Cindy Cima Edwards is a published jewelry designer and a member of the 2012-2013 ICE Resin® Creative Team! 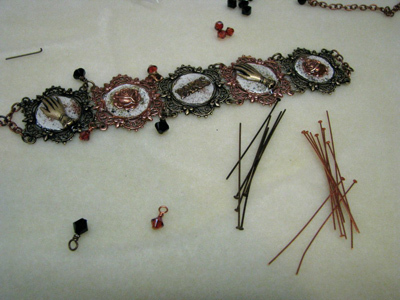 "Designing jewelry provides me with the creative outlet I have searched for most of my life. It allows me the freedom to create with little-to-no rules, using endless combinations of color and textures, as well as continue to learn new skills and techniques".